President Trump has failed to stop climate change work at EPA. The administration has repeatedly tried to slash the agency's climate funding, only to be rebuffed by Congress. That has left a small cadre of EPA climate experts in an awkward position, working in jobs they know their boss would prefer to ax. Some EPA climate staffers have left the agency since Trump — who has called climate change a "hoax" — entered the White House. Others continue to show up for work every day despite staff cuts, flagging morale and a lack of support for their work from 1600 Pennsylvania Ave.
"It's not a happy place," said an EPA staffer familiar with the agency's climate work. That employee spoke to E&E News on the condition of anonymity. Among EPA's climate workers: a small but dedicated team of career staffers in the Climate Change Division in EPA's Office of Air and Radiation. They work on initiatives aimed at protecting the ozone layer and improving regional air quality, among other things. "We still have ongoing work that's basically a carryover from previous years," the EPA staffer said. "So it's good that we're still producing science." But Trump's repeated requests that Congress zero out funding for climate work has taken a toll on employees. "The morale is pretty low," the EPA staffer said. "We all joke about it. You kind of have to have a little bit of gallows humor to keep going every day. We say things like, 'Why don't we just ask Trump, because I hear he has a good intuition for science?' That kind of stuff." In an interview with the Associated Press earlier this year, Trump addressed his stance on climate change, extolling his own "natural instinct for science" (Greenwire, Oct. 17). 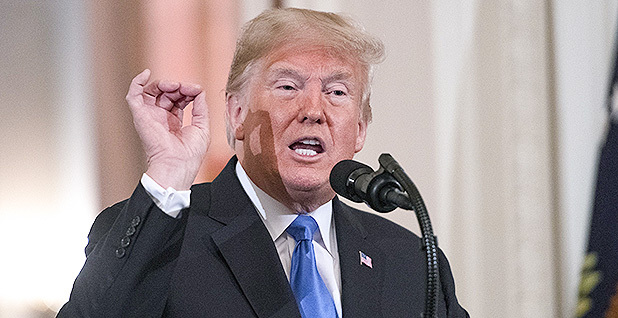 Trump's fiscal 2019 budget request targeted hundreds of millions of dollars in climate science and climate mitigation efforts across federal agencies, including EPA and NASA (Climatewire, Feb. 13). The phrase "climate change" only appeared once in the narrative summary of the budget request, and that was for the proposed elimination of EPA's Climate Change Research and Partnership Programs. Also on the chopping block was EPA's Atmospheric Protection Program. The proposed cuts drew cheers from conservatives who take issue with mainstream climate science. "I think that the EPA needs major budget cuts, and I would support including their climate change work in those budget cuts," said Myron Ebell, director of the Competitive Enterprise Institute's Center for Energy and Environment, who led Trump's EPA transition team. "In terms of the climate program in particular," he added, "it would be better to just get rid of it and start all over." House and Senate appropriators ended up rejecting the president's calls for steep cuts, with programs at EPA and the Interior Department ultimately receiving a boost in funding (E&E Daily, May 25). Budget request aside, though, Trump's hiring freeze has hollowed out staffing at EPA. That's trickled down to the climate division. Shortly after his inauguration in January 2017, Trump signed a presidential memorandum implementing a hiring freeze for all federal agencies. The Office of Management and Budget lifted the hiring freeze that April, but EPA decided to temporarily keep it in place to meet Trump's long-term workforce reduction goals. Hundreds of EPA staffers took buyouts offered last year (Greenwire, Nov. 22, 2017). Even before Trump took charge, the climate division was feeling the effects of hiring freezes. And more people have left under the current administration without being replaced. "We haven't hired anyone in the last four or five years," the EPA staffer said. "After the election, we got three or four people in who were fellows or coming from other parts of the agency. I think those are the only people we've hired in the last seven years. There were hiring freezes before Trump." The source added, "A lot of people have left [under Trump]. A lot of people are looking for other positions. And there's not a lot of effort by our management to keep people, which doesn't feel great." Dina Kruger, who was director of EPA's Climate Change Division until 2011, said some of her former colleagues are still at the agency. "There has definitely been staff attrition on the climate issues," said Kruger, who now leads the consulting firm Kruger Environmental Strategies LLC. "Many of the Climate Change Division staff that worked for me are still hanging in there, and I think it is probably the same for the Climate Protection Partnerships Division. "But people have left, in the climate change area as well as in many other offices at EPA. In addition, some climate staff have found other jobs at EPA that make them feel better about their work." Career employees in the climate change division have experienced some censorship from political appointees higher up the chain, the EPA staffer said. The division is responsible for managing EPA's webpage on climate change indicators. Under past administrations, the webpage was updated every six months as new data became available. "When I was there, [EPA] regularly put out this climate change indicators report," said Janet McCabe, who served as acting EPA air chief under President Obama. "It was really great because it had an increasing number of indicators out in the real world, and it cataloged the impacts of climate year after year. "It included things like snowfall, ice melt, sea-level rise or ticks," McCabe added. "There were a bunch of real-world indicators that provided this great timeline of how climate change was affecting these metrics." Under Trump, however, the climate change indicators webpage has languished. "It hasn't been updated since 2016," the EPA staffer said. "Every year, we get a new data point. The Arctic sea ice extent for that year, for example. Or a new number from [the Centers for Disease Control and Prevention] on Lyme disease cases. So usually we update that site every six months, but we haven't been allowed to." The management team in the climate division is hesitant to ask political appointees in the Office of Air and Radiation — including Senior Policy Adviser Mandy Gunasekara — about updating the site, that person said. "I've heard rumors that Mandy and team don't approve anything to do with climate change on the website," the source said. The political appointees may be wary of news stories about federal climate change information disappearing under Trump. The Environmental Data & Governance Initiative, which has been tracking changes to federal government webpages under the Trump administration, frequently points out such changes to reporters (Climatewire, Nov. 2). "No one is willing to touch the website because everyone's afraid of the news stories that say, 'EPA changed this,'" the EPA staffer said. Career EPA staff members are reluctant to talk to the press about climate work under Trump. "They have to be super, super careful," Kruger said. EPA's press shop didn't respond to a request for comment for this story. Still, under Trump, staffers in the climate division have continued their research on how climate change affects human health. They've also done work on air quality and vector-borne diseases. And their economic modeling will inform the next National Climate Assessment, a report summarizing the impacts of climate change in the United States. The report is expected to be released next month. "It's hopefully coming out in December. All signs point to it coming out then," the EPA staffer said. "It's been a surprising relief how little interference there has been from the administration politicals with that. They have mainly maintained a hands-off-the-science attitude. They don't want to be seen as manipulating the science." In addition to the Climate Change Division, the air office's Office of Atmospheric Programs includes a Stratospheric Protection Division, which is responsible for implementing Title VI of the Clean Air Act on stratospheric ozone protection. McCabe recalled that during the Obama administration, the Stratospheric Protection Division worked on the Kigali Amendment to the Montreal Protocol, which aimed to ratchet down the use of ozone-depleting chemicals. The division also worked with the State Department on international climate efforts leading up to the Paris climate accord and the Conference of the Parties to the U.N. Framework Convention on Climate Change, McCabe said. It remains unclear what the division has accomplished under Trump. The Kigali Amendment has not been ratified by the U.S. Senate, and the Trump administration has abandoned the Obama administration's 2015 rule aimed at phasing out the use of potent heat-trapping gases known as hydrofluorocarbons (Climatewire, Sept. 17). Trump has also threatened to withdraw the United States from the Paris Agreement, and the White House plans to send another fossil-fuel-touting panel to the next Conference of the Parties (Climatewire, Nov. 16). Kruger said career staffers will adjust to the reality that they won't be working on the kinds of climate rules that came out of the Obama EPA. "In my view, the majority of career staff at EPA are going to do what they can do," she said. "But they are not going to try that hard, and they are certainly not going to be burning the midnight oil doing the kinds of rules that we were doing during the Obama administration."